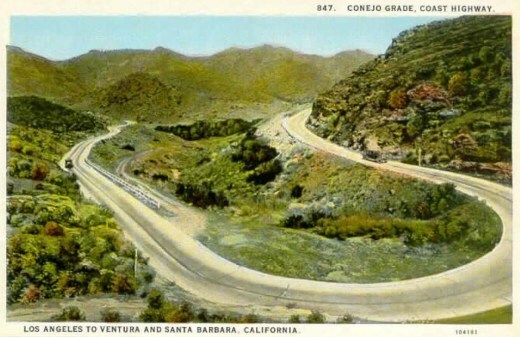 Horseshoe shaped section of the Conejo Grade in the 1920s. The Conejo Grade is the section of Highway 101 that connects the Conejo Valley with Camarillo. It is a four mile stretch of freeway with a significant 7% grade. Going down the Conejo Grade from Newbury Park to Camarillo today. At 3:30 p.m. on the afternoon of May 1, 1937, a newly upgraded and realigned Conejo Grade premiered after a day of celebration commencing at the ranch of Adolfo Camarillo. Camarillo, the namesake of what in 1964 became the City of Camarillo, donated the right of way to enable the grade to be realigned. Actor Leo Carrillo entertained guests at Camarillo's ranch at the bottom of the grade. Grand opening of the newly realigned Conejo Grade on May 1, 1937. The old Conejo Grade was constructed by the California Highway Commission in 1914-1915. The previous route had 49 twists and turns, making it somewhat of a hazardous route (albeit somewhat less steep than the current grade). The new Conejo Grade cut the number of curves by 75%. Another view of the Conejo Grade before it was realigned in 1937. The new 1937 Conejo Grade cost a total of $570,000, which is less than the average cost of a house in the Conejo Valley today! Over a year and a half, the project employed about 100 workers who put in over 272,000 hours, excavating over 800,000 cubic yards of mostly hard rock. Talk about rock stars! 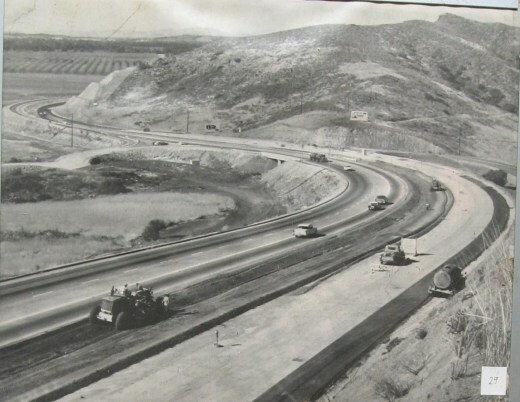 In the 1950s and 1960s, Caltrans further widened and improved Highway 101 over the Conejo Grade. Several decades later, as Ventura County grew and the cities of Camarillo and Thousand Oaks incorporated in 1964, Caltrans continued to widen and improve the highway to what it is today. Source for historical information: "California Highways and Public Works" (May 1937) - official journal of the State of California Division of Highways, Department of Public Works. Special thanks to the Pleasant Valley Historical Society for providing historic photos.